This is an epic race report and the suspense is killing me! I am going to add "each mile under 6:00 carries me further away fro disaster in quadratic proportion" to my permanent lexicon. Seems to be your best performance in quite a while. Good job coming back with all your busy life changes of late. Nice talking to you for a few minutes yesterday. I had no idea people put this much thought into a race! I was mostly thinking about what I would have for breakfast when it was all over. You ran a smart race. Next one I'll be following you..
Smart race, Sasha! Nicely done! This is an epic report. I agree. You obviously have a much larger database between your ears than I do. Guys like you and Rob can probably get away with the use of "quadratic proportion." If I were to use the term, the usage and grammer police would arrest me for fraudulent activities. Your Saturday tempo training runs have been huge for me. I am a fan! Thanks! Great job Sasha! How could you not recognize John? He's like 8 foot tall. Great race! It sounds like the finish with the whole family was the perfect ending to the race. your reports are always full of great information and helpful analysis. i often read your past reports right before a race for the best inside scoop -- i read your des news 2008 report (again) on sunday. great race and congratulations on the third place finish. i saw the picture of you finishing with your family running alongside you -- i bet that was a special moment. i too have had similar thoughts about running along the parade route, as there seems to be little to no interest in the runners, often to the point of completely disregarding that there is a race going on. in 2009, someone threw a handful of "snaps" fireworks right at my ankles! i think many of them see it as boring (or at least less exciting than the 10k), because at that point in the race most everyone in the field has slowed considerably, often to a jog or a shuffle. it's probably more frightening than it is interesting or exciting. Awesome race Sasha and a great, detailed report. I like how tactical and prepared you are for your races, mile by mile. Congrats on the top 3 finish. 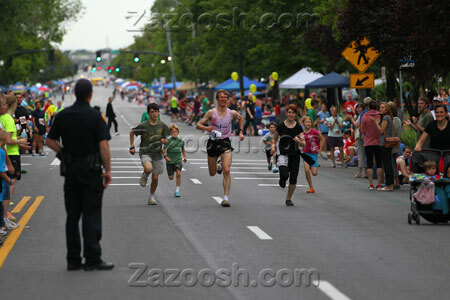 That's a cool picture of your family all finishing together too! Congratulations on your finish, that's an impressive time. Looks like you are going to rule the masters division within a year, are you excited about this? 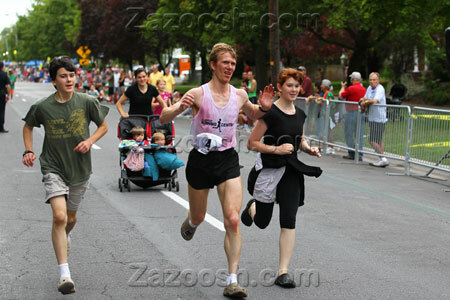 I ran this race in Crocs too, last year as well and Ogden. Great running shoe!! Your blog, and advice has helped me more than anything. Thank you! I love that picture of the family finishing together! Really awesome. 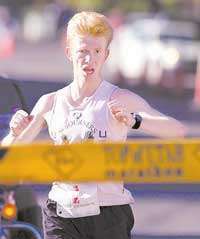 Fantastic report, and congrats on another very strong marathon performance and a podium finish. A 4 min positive split is pretty good on that course. You held it together and finished strong. A great race Sasha. I was particularly impressed how you powered up Little Mountain and the strength of your closing miles. Great job on the marathon, so fun to see you and cheer you on. I have often wondered if you see who is cheering you on but you had both eyes open so I thought you might have. You looked strong when we saw you.